Living in Austin has been fun and I have a couple things I highly recommend if you're visiting: food and urban nature. While my preferred route is about 6.8 miles, there are plenty of opportunities to cut the hike/biking short if you want. However, I definitely would recommend doing the whole thing in order to get the best views. Definitely go in the morning (especially in the summer), to avoid the heat. If you take my route, I recommend you start at Zilker Park. You can definitely just hangout there by the volleyball sand courts/dog park and get some nice pictures of the skyline, though. 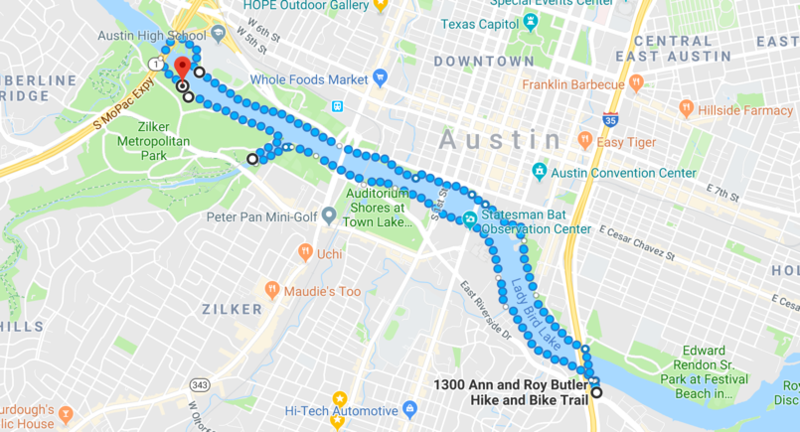 However, if you get on the trail headed east, you'll eventually get to Barton Creek where you hit a nice little corner with a nice, more up-close view of the skyline and the water. A few steps from that corner, you'll be met with many turtles, ducks, and a few fairly territorial swans. Just don't mess with the swans. As you head south from there, you'll encounter a bridge that goes over Barton Creek and head north once you're across it. You'll start to get closer to downtown and eventually get to the off-leash dog park. You'll see some of the cutest dogs ever. Continuing east, you'll just get more sights and sounds of an urban park. You'll eventually end up on the Austin Boardwalk which is pretty nice. Once you cross over to the downtown side, you can stop at some place like Berry Austin for some froyo or trek onward. There's a bit less going on on the northside but still an enjoyable and peaceful walk back around to Zilker. If you're not feeling up for a walk around the trail, you should definitely still rent a kayak and cruise the water. The lake/river downtown are conveniently located for kayaking/paddle boarding but if you don't mind going a little further out, you could also check out Lake Travis. Fresca's, order the "Cafe de Olla"
For decent coffee with a nice view, try Mozarts'.